Ron and Sherrill tied-the-knot in a Cheyenne Little America wedding last Saturday during a beautiful, intimate ceremony surrounded by friends and family. Little America Hotel is a beautiful Cheyenne wedding venue that boasts old Western charm while being an upscale, lovely venue for a Wyoming wedding. This was our first wedding we photographed there and I can’t wait for another. Any bride looking to get married in Cheyenne needs to at least look at the Little America. We loved it. The staff and service were amazing. 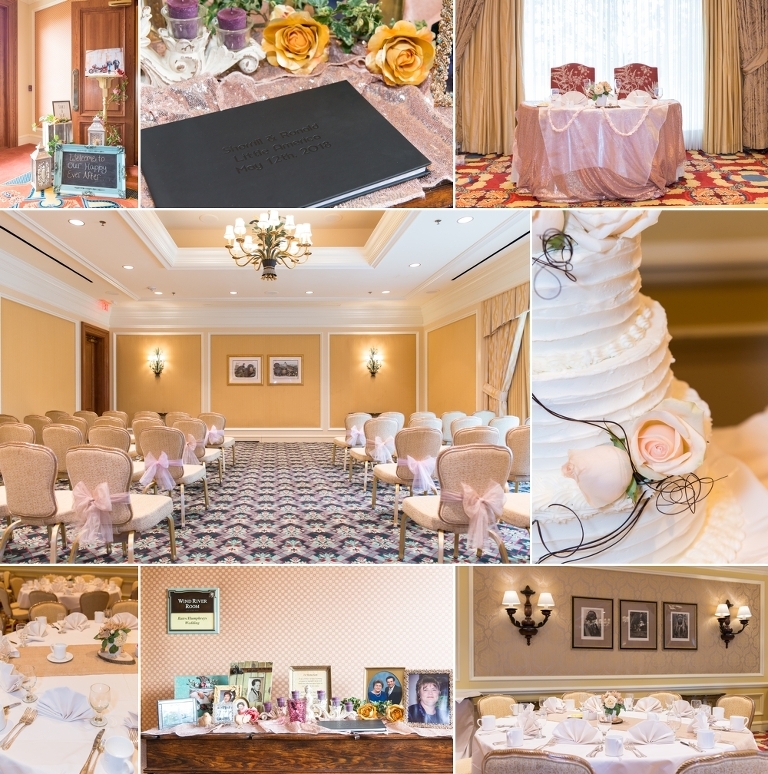 Our bride and groom booked this venue within 10 days of their wedding date and the Little America accommodated them perfectly. Their day went off without a hitch on such short notice. As Wyoming wedding vendors, I was extremely impressed with everything this venue offers and did to make our couples day the best. Not only did we take their engagement photos, we created a beautiful custom wedding invitation just for them. If you need Cheyenne engagement session inspiration, just check out Ron and Sherrill’s beautiful pre wedding shoot at the Cheyenne Botanic Gardens with their Harley, see their engagement session here. We loved their biker couple attire, they looked freaking awesome, see this post about What to Wear for Your Engagement Session. Not only are we wedding photographers but we are graphic artists and we love to create wedding must haves for our amazing couples. We love to make wedding stationery and wedding guest sign books with the photos from your engagement session. 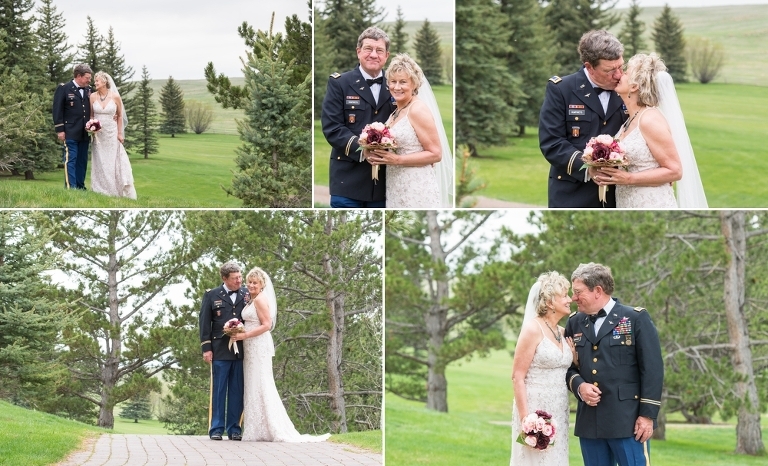 The Little America in Cheyenne, Wyoming is a gorgeous wedding venue for any size wedding. The ballrooms are amazing and the property to shoot candid wedding photos on is just lovely. Cheyenne does not have a lot of trees around it but you would never know it by how beautiful they have landscaped the property. While it rained a little bit on their wedding day, its good luck and cleared up just enough to get the newlyweds outside for some photos. The bride’s bouquet was handmade by our friends over at La Fleur Florist in downtown Cheyenne. Can you believe the flowers in the bride’s bouquet are artificial? 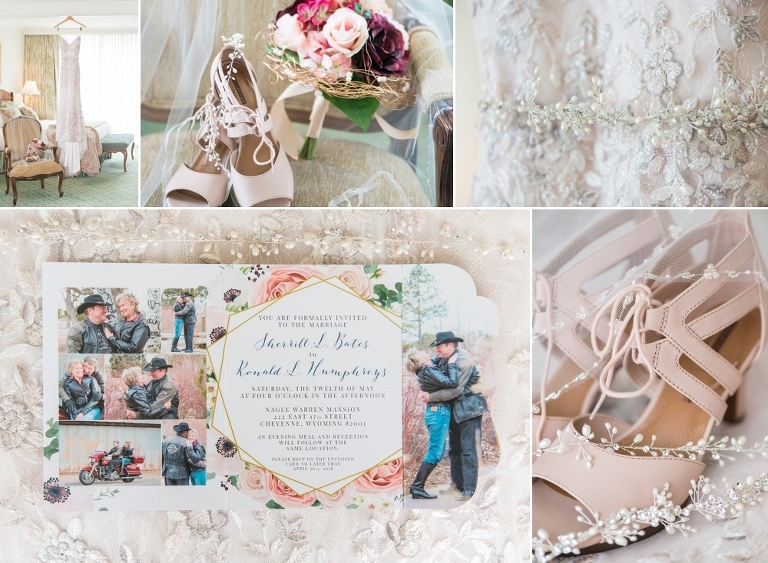 Her bouquet was romantic and when I designed their wedding invitations, I made it to match. 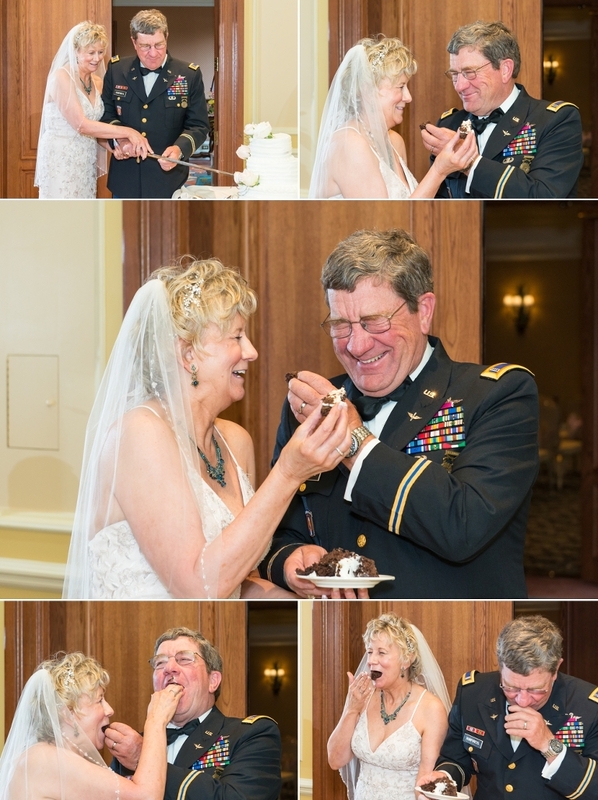 I love these sweet photos of this military couple. Ron was in the Army and Sherrill was in the Air Force, both retired. Thank you for your service. 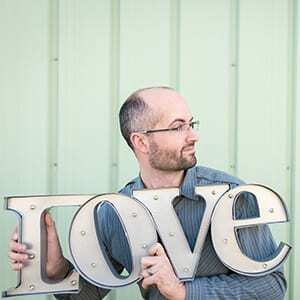 This Cheyenne Little America wedding was a great way to kick off our summer wedding season. 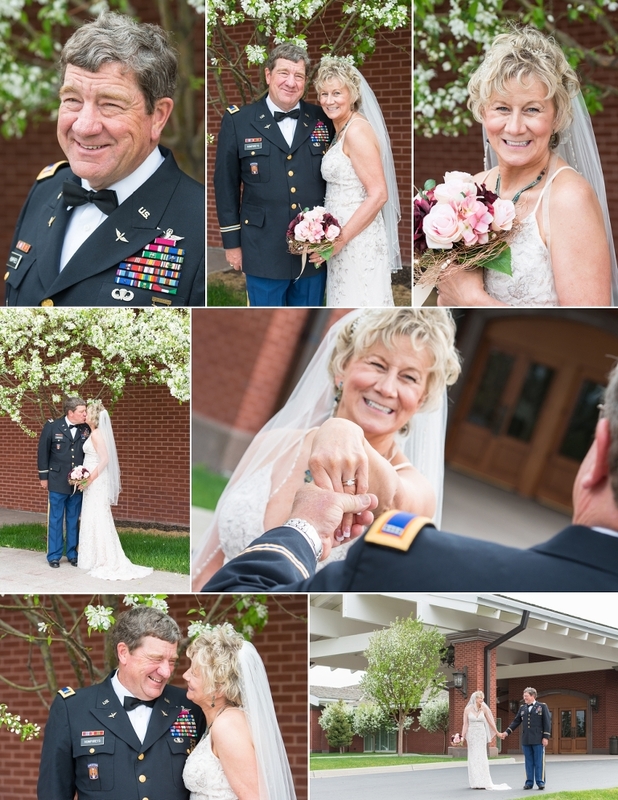 We love being Cheyenne wedding photographers, there is so many great Wyoming wedding venues and wedding professionals in our historic town that Wyoming brides planning their wedding will have some of Wyoming’s best wedding professionals all in one place. Ron and Sherrill had their first dance in the beautiful Teton Room at Cheyenne Little America Hotel. Cheyenne weddings at the Little America are some of my favorites since we have a beautiful photography studio right down the street. Cheyenne is a small town and everything is so close. It may be windy but we love it. Here is another of my two favorite images from their wedding day, you can see how happy they are and probably a little happy to be getting off their feet.